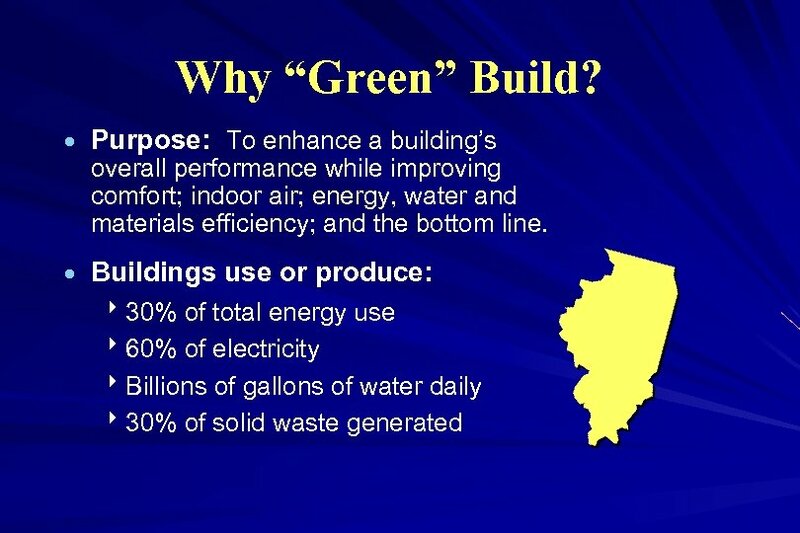 What is a Green Building? 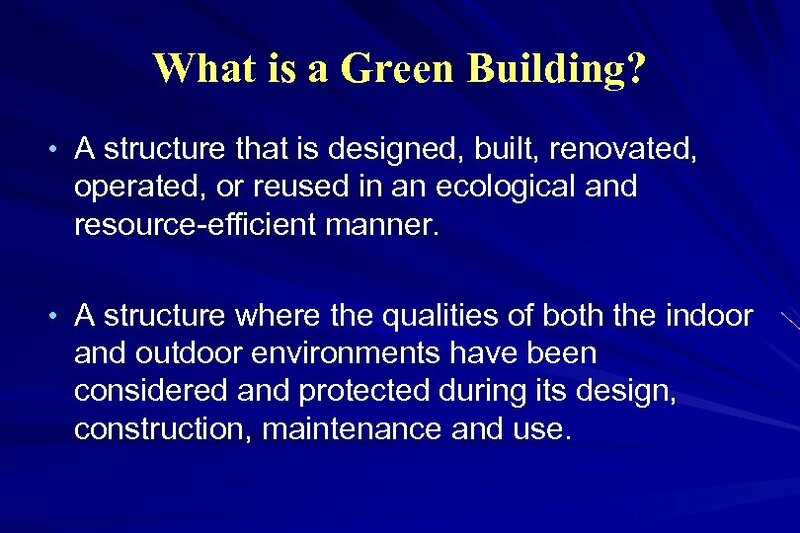 • A structure that is designed, built, renovated, operated, or reused in an ecological and resource-efficient manner. • A structure where the qualities of both the indoor and outdoor environments have been considered and protected during its design, construction, maintenance and use. 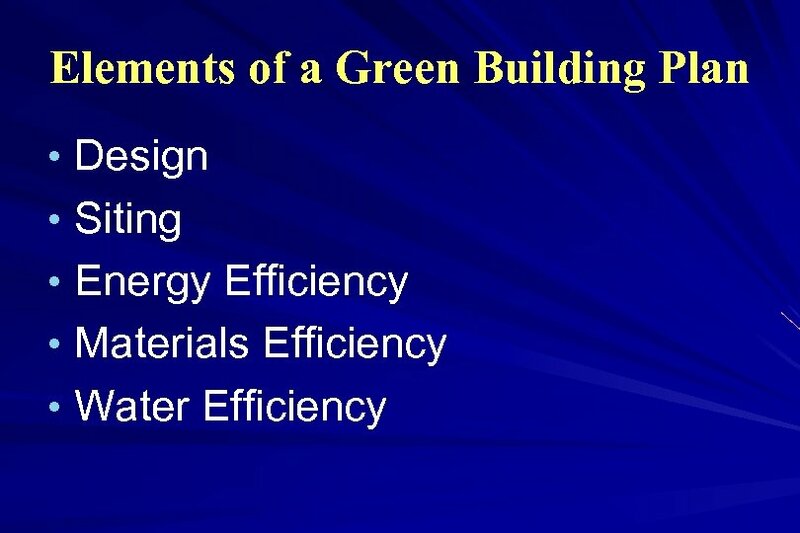 What makes a Building Green? • It's made with recycled, salvaged or agricultural wastes (most commonly crop straws). • It conserves natural resources because it's especially durable or it's made with a rapidly renewing material such as bamboo that can be harvested every ten years. 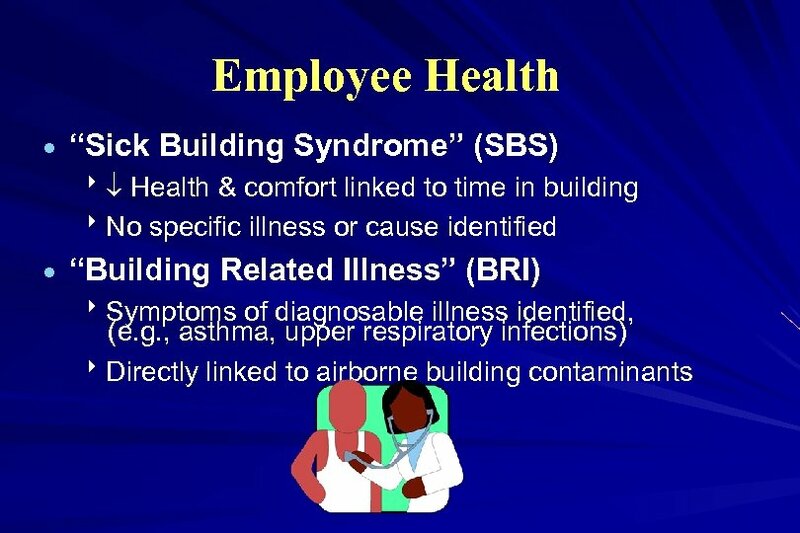 • It enhances indoor air quality because it has low or no emission of toxic chemicals into the air or because it helps block the introduction of indoor contaminants such as mold. 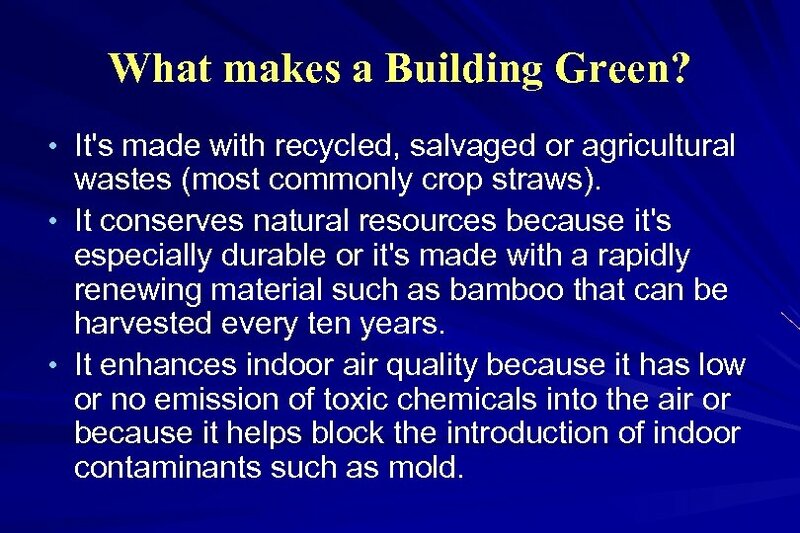 What makes a Building Green Contd • Its manufacture does not produce toxic emissions. 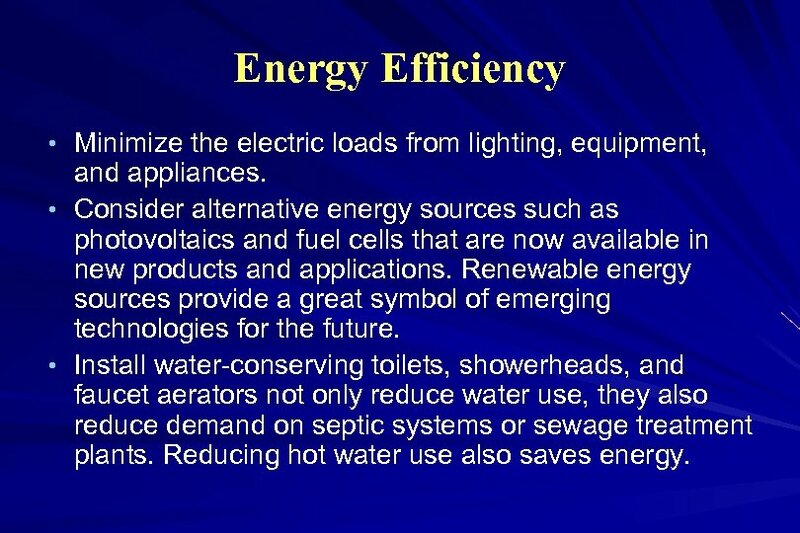 • It saves energy or water. 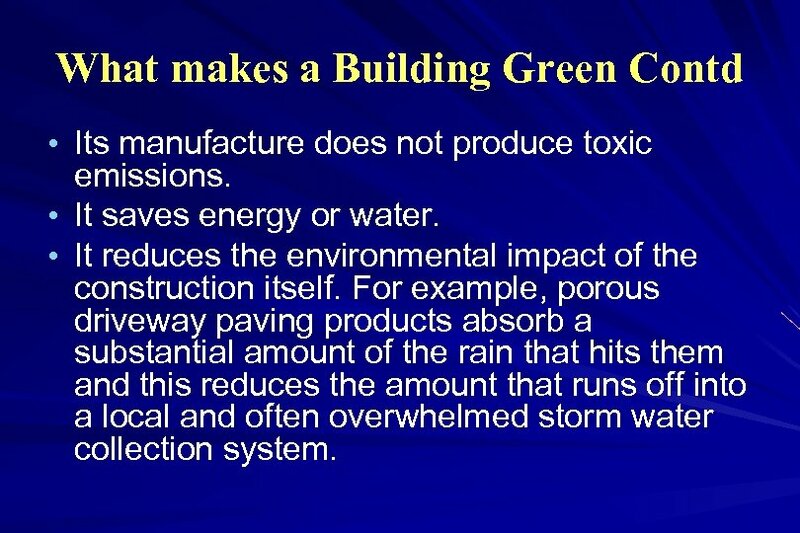 • It reduces the environmental impact of the construction itself. For example, porous driveway paving products absorb a substantial amount of the rain that hits them and this reduces the amount that runs off into a local and often overwhelmed storm water collection system. 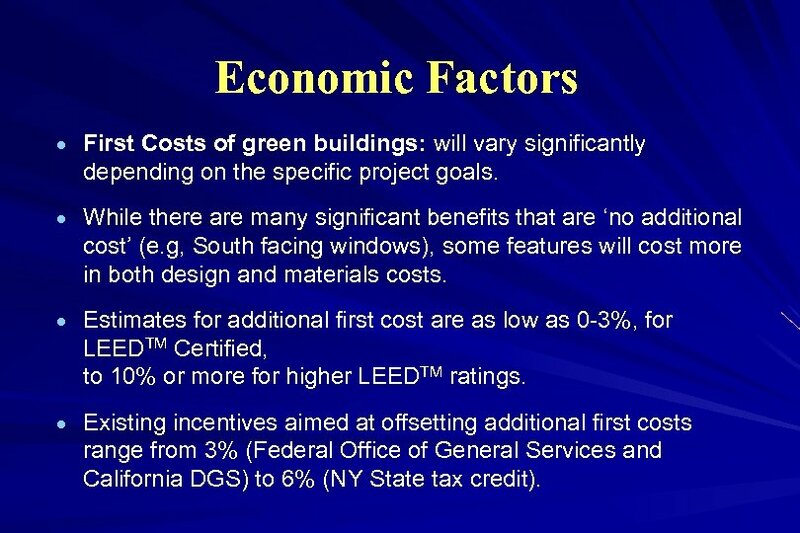 Economic Factors · First Costs of green buildings: will vary significantly depending on the specific project goals. 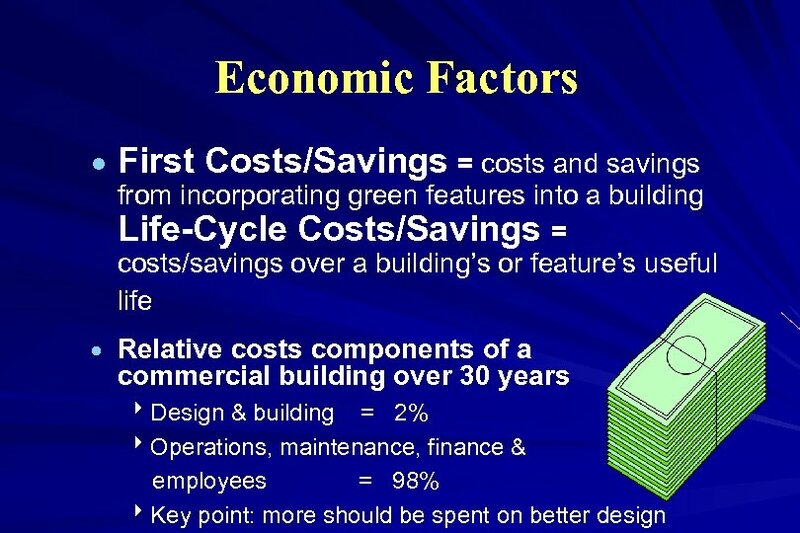 · While there are many significant benefits that are ‘no additional cost’ (e. g, South facing windows), some features will cost more in both design and materials costs. 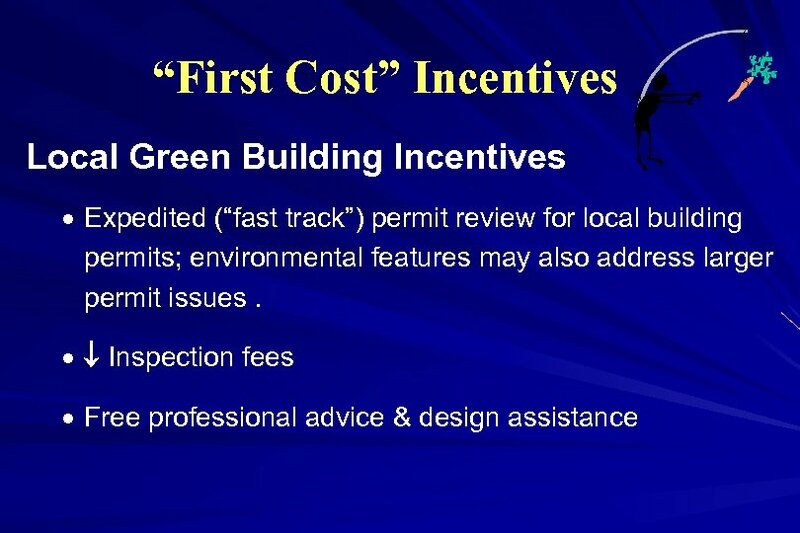 · Estimates for additional first cost are as low as 0 -3%, for LEEDTM Certified, to 10% or more for higher LEEDTM ratings. 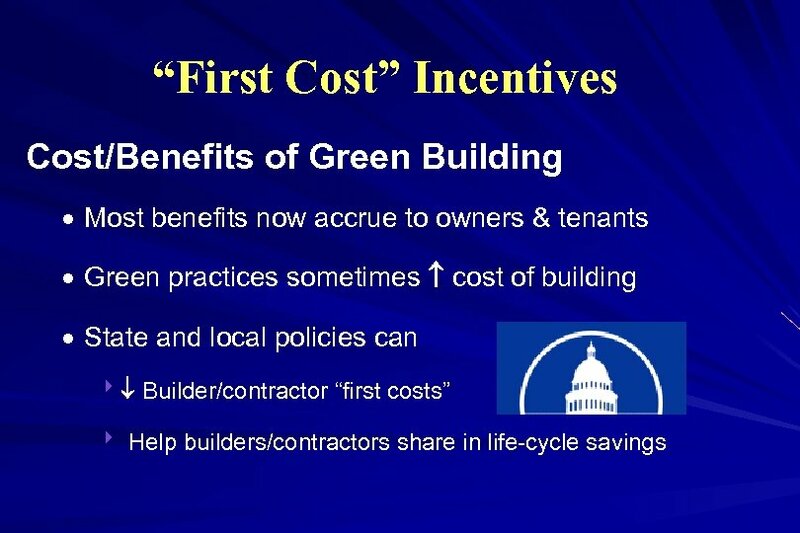 · Existing incentives aimed at offsetting additional first costs range from 3% (Federal Office of General Services and California DGS) to 6% (NY State tax credit). 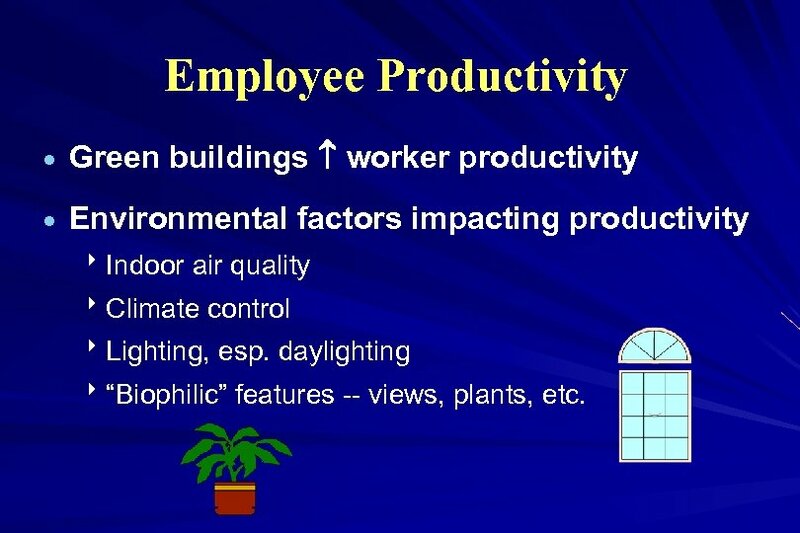 Employee Productivity · Green buildings worker productivity · Environmental factors impacting productivity 8 Indoor air quality 8 Climate control 8 Lighting, esp. 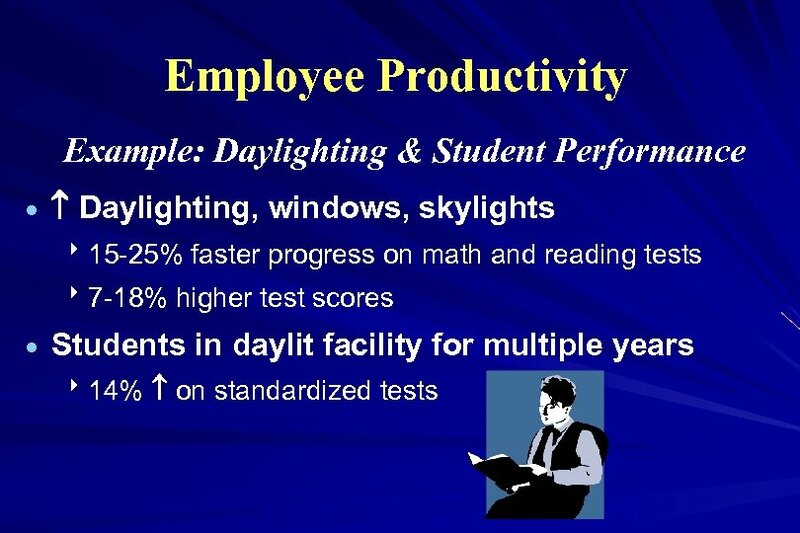 daylighting 8“Biophilic” features -- views, plants, etc. Design • Smaller is better: Optimize use of interior space through careful design so that the overall building size--and resource use in constructing and operating it--are kept to a minimum. 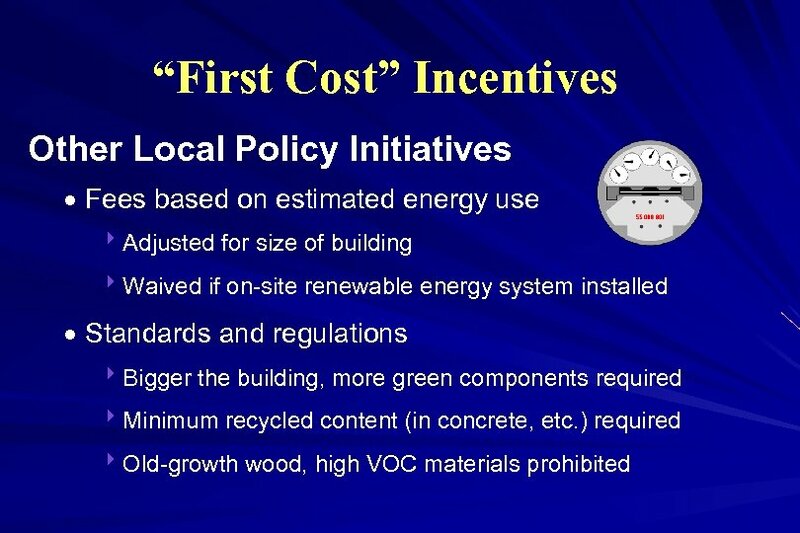 • Design an energy-efficient building: Use high levels of insulation, high-performance windows, and tight construction. In southern climates, choose glazing with low solar heat gain. 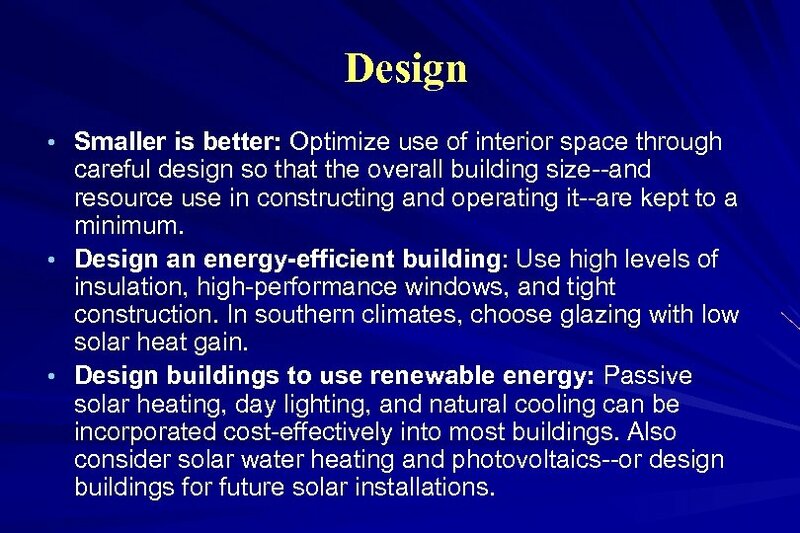 • Design buildings to use renewable energy: Passive solar heating, day lighting, and natural cooling can be incorporated cost-effectively into most buildings. 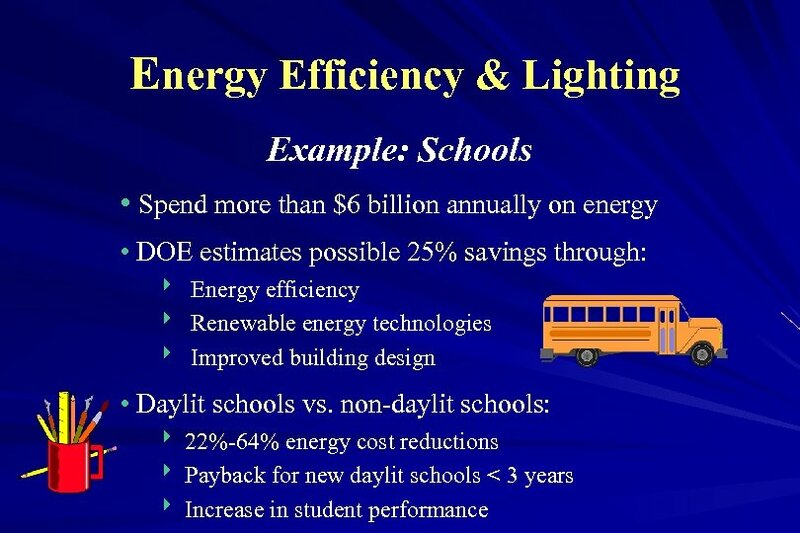 Also consider solar water heating and photovoltaics--or design buildings for future solar installations. 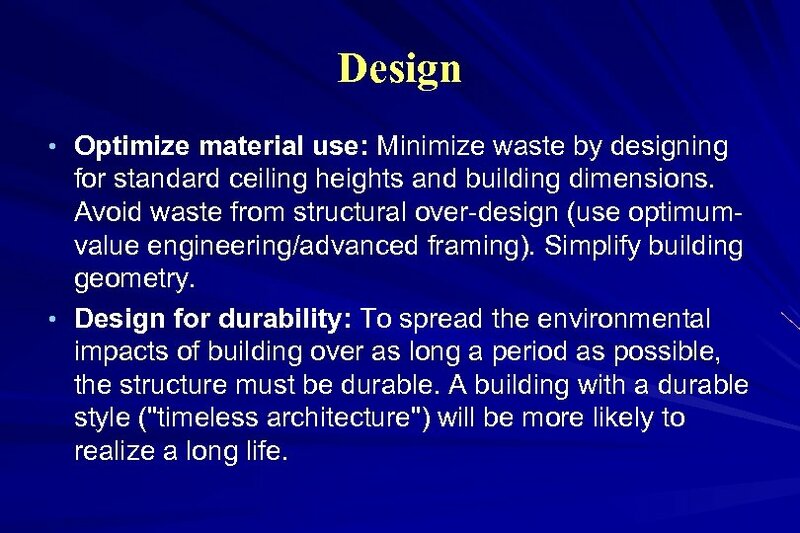 Design • Optimize material use: Minimize waste by designing for standard ceiling heights and building dimensions. 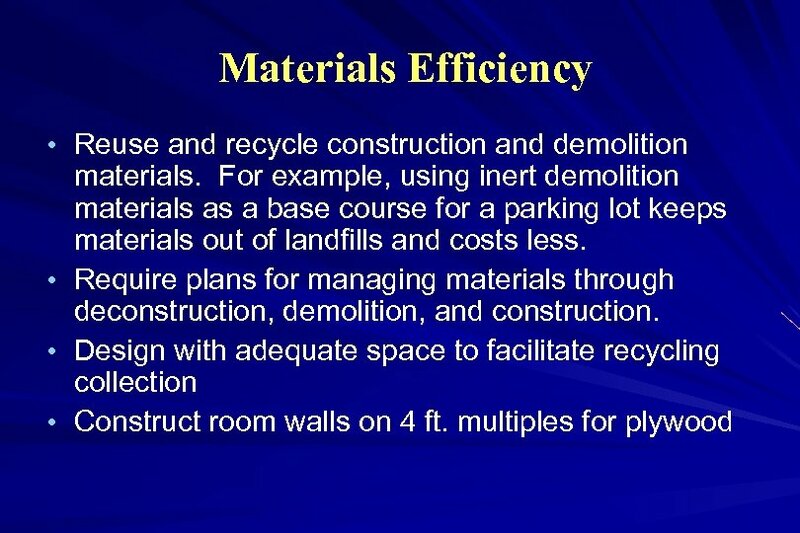 Avoid waste from structural over-design (use optimumvalue engineering/advanced framing). Simplify building geometry. 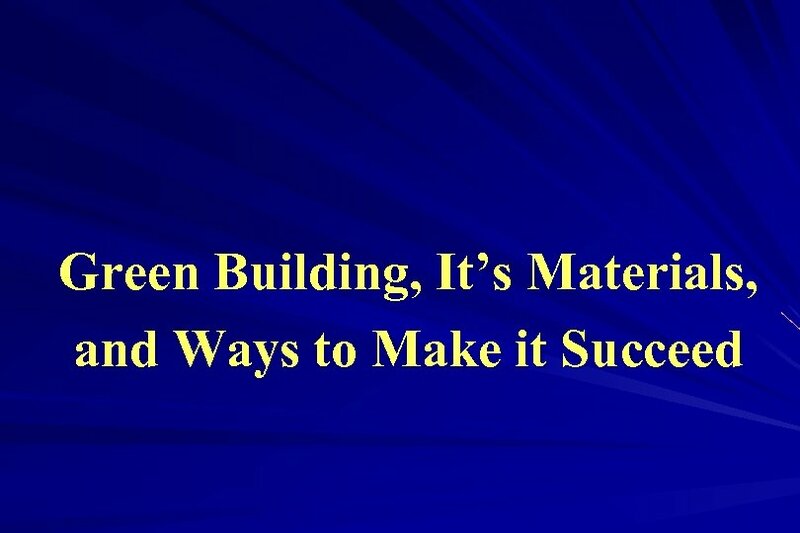 • Design for durability: To spread the environmental impacts of building over as long a period as possible, the structure must be durable. 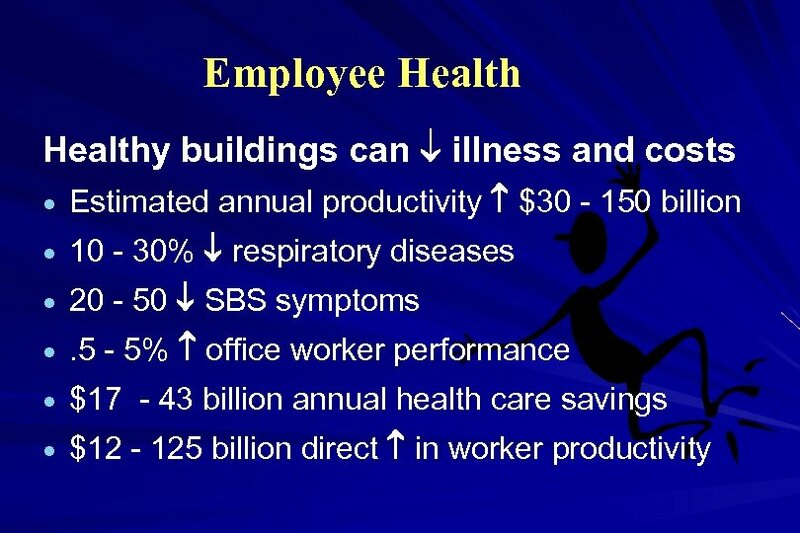 A building with a durable style ("timeless architecture") will be more likely to realize a long life. 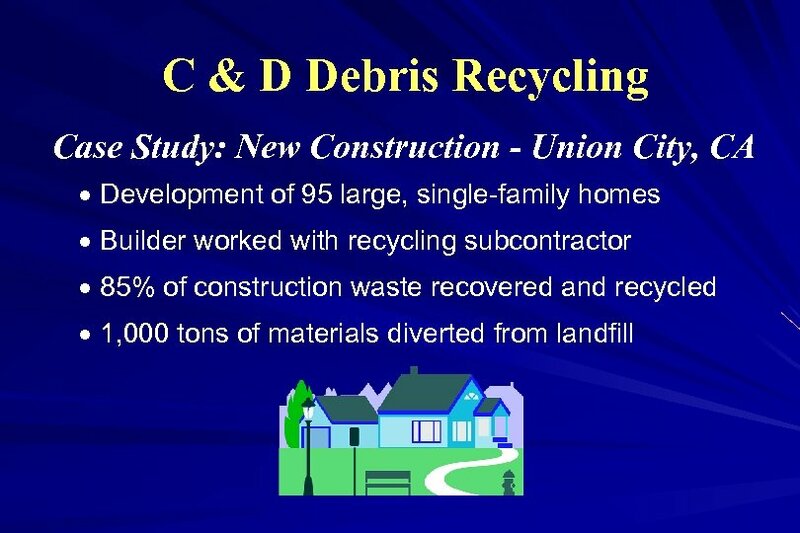 Design • Make it easy for occupants to recycle waste: Make provisions for storage and processing of recyclables: recycling bins near the kitchen, under sink compost receptacles, and the like. 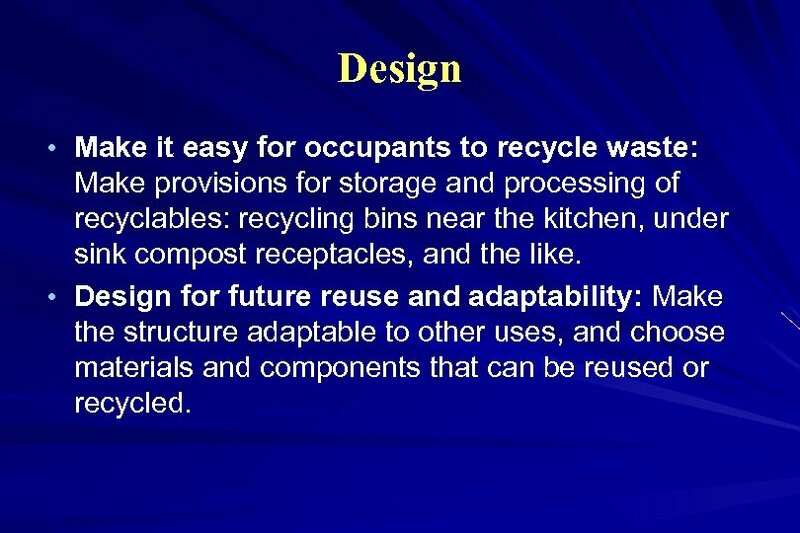 • Design for future reuse and adaptability: Make the structure adaptable to other uses, and choose materials and components that can be reused or recycled. 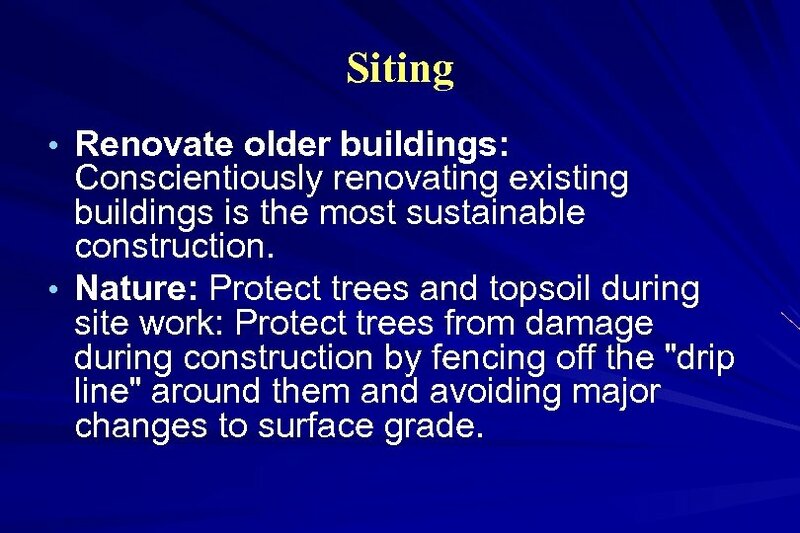 Siting • Renovate older buildings: Conscientiously renovating existing buildings is the most sustainable construction. • Nature: Protect trees and topsoil during site work: Protect trees from damage during construction by fencing off the "drip line" around them and avoiding major changes to surface grade. 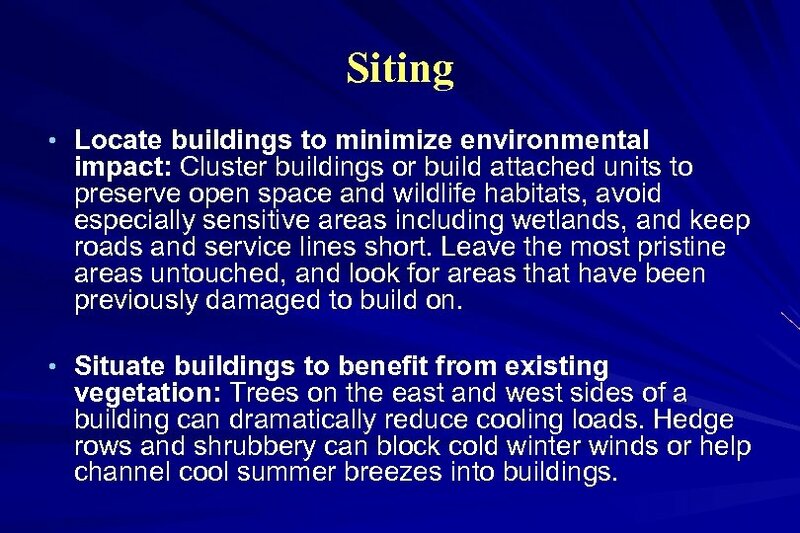 Siting • Locate buildings to minimize environmental impact: Cluster buildings or build attached units to preserve open space and wildlife habitats, avoid especially sensitive areas including wetlands, and keep roads and service lines short. 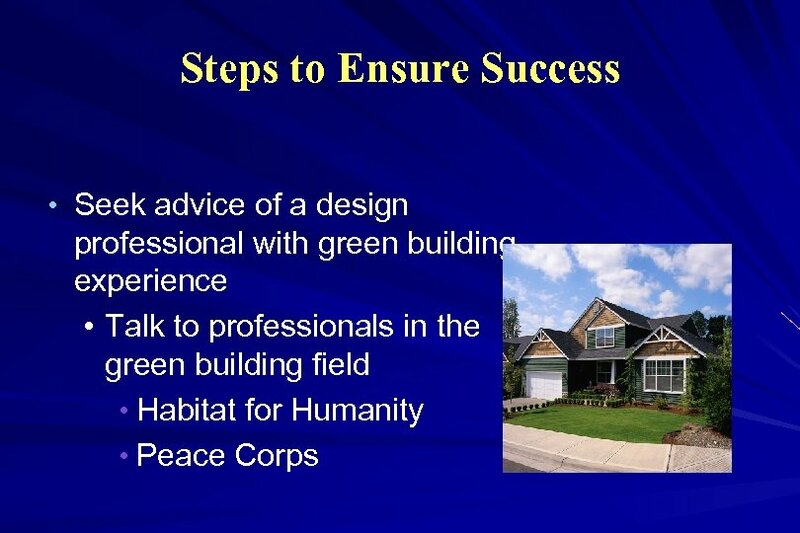 Leave the most pristine areas untouched, and look for areas that have been previously damaged to build on. 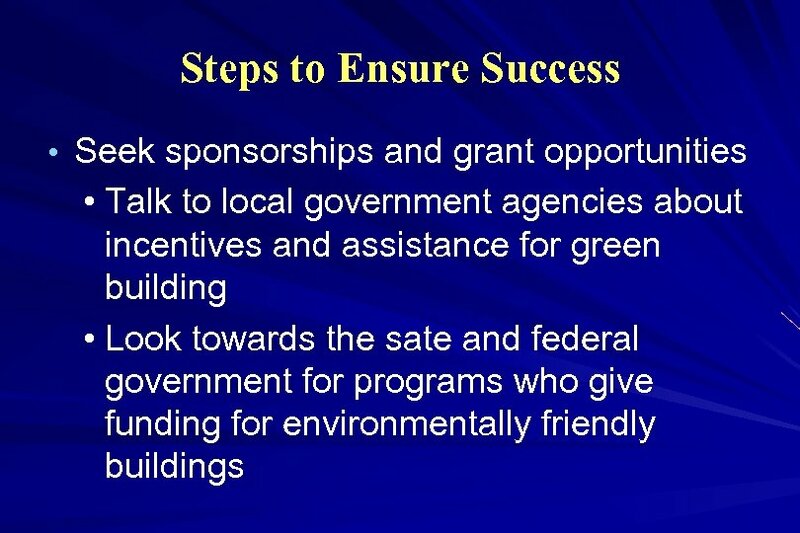 • Situate buildings to benefit from existing vegetation: Trees on the east and west sides of a building can dramatically reduce cooling loads. Hedge rows and shrubbery can block cold winter winds or help channel cool summer breezes into buildings. 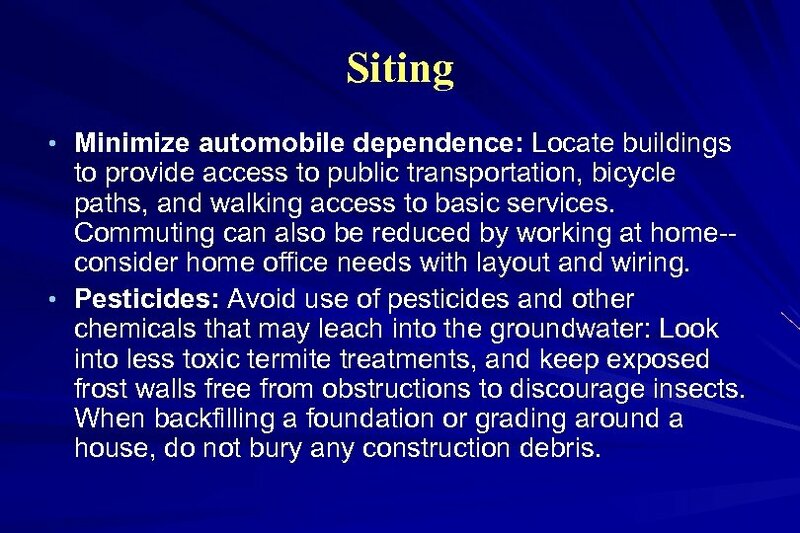 Siting • Minimize automobile dependence: Locate buildings to provide access to public transportation, bicycle paths, and walking access to basic services. 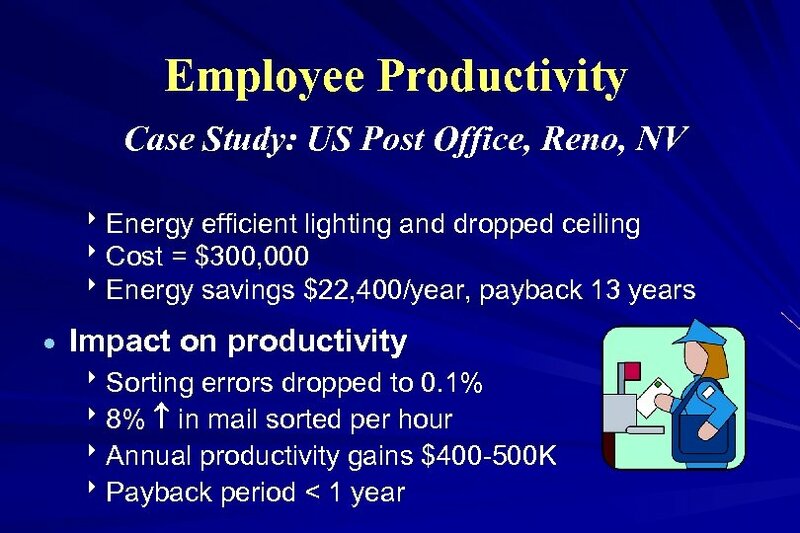 Commuting can also be reduced by working at home-consider home office needs with layout and wiring. 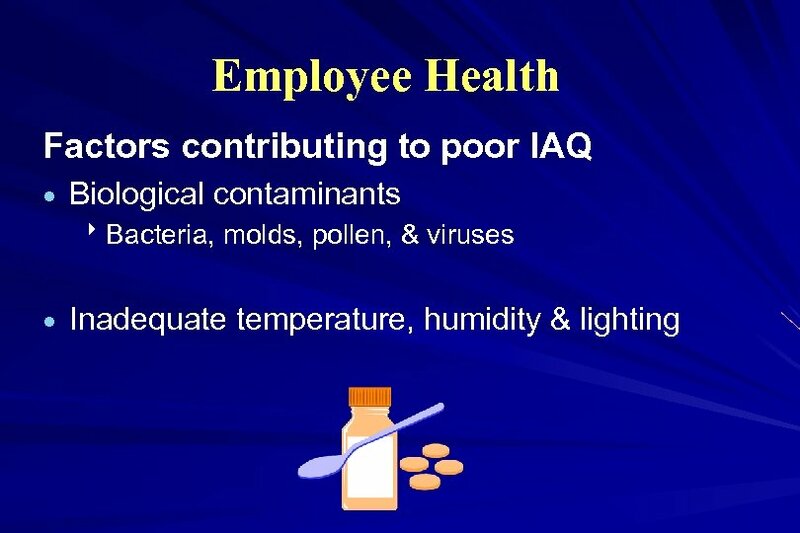 • Pesticides: Avoid use of pesticides and other chemicals that may leach into the groundwater: Look into less toxic termite treatments, and keep exposed frost walls free from obstructions to discourage insects. When backfilling a foundation or grading around a house, do not bury any construction debris. 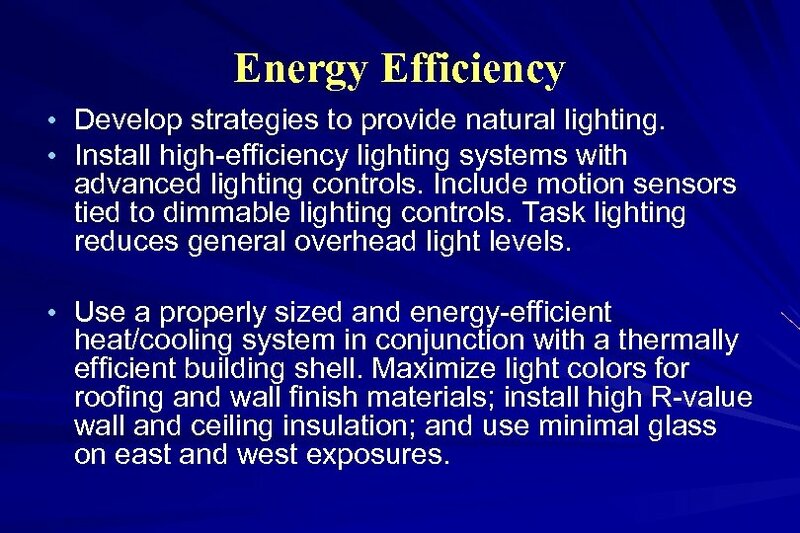 Energy Efficiency • • Develop strategies to provide natural lighting. Install high-efficiency lighting systems with advanced lighting controls. Include motion sensors tied to dimmable lighting controls. 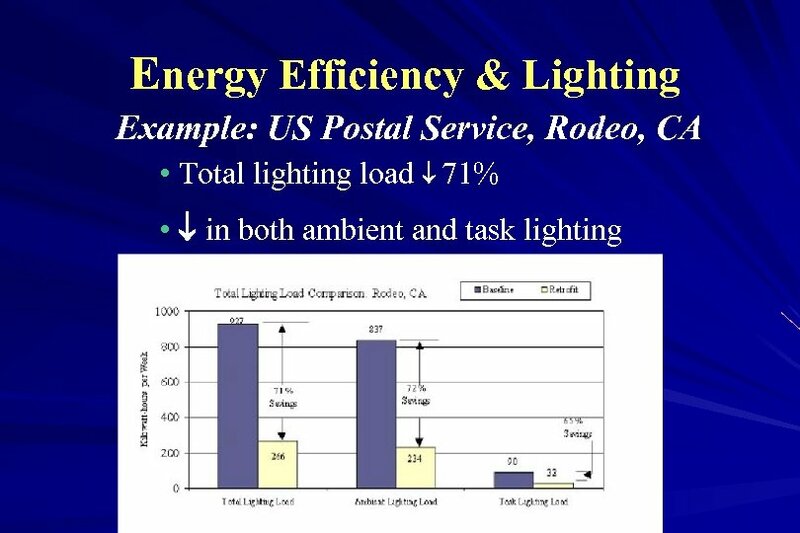 Task lighting reduces general overhead light levels. 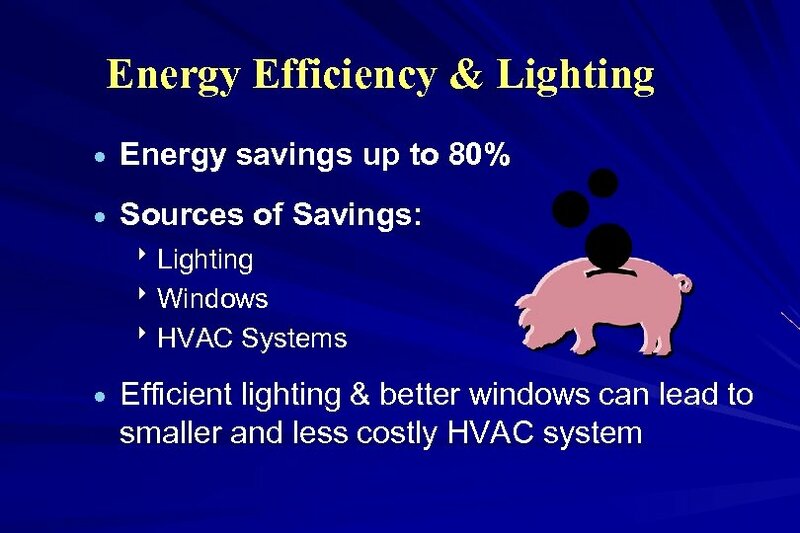 • Use a properly sized and energy-efficient heat/cooling system in conjunction with a thermally efficient building shell. Maximize light colors for roofing and wall finish materials; install high R-value wall and ceiling insulation; and use minimal glass on east and west exposures. 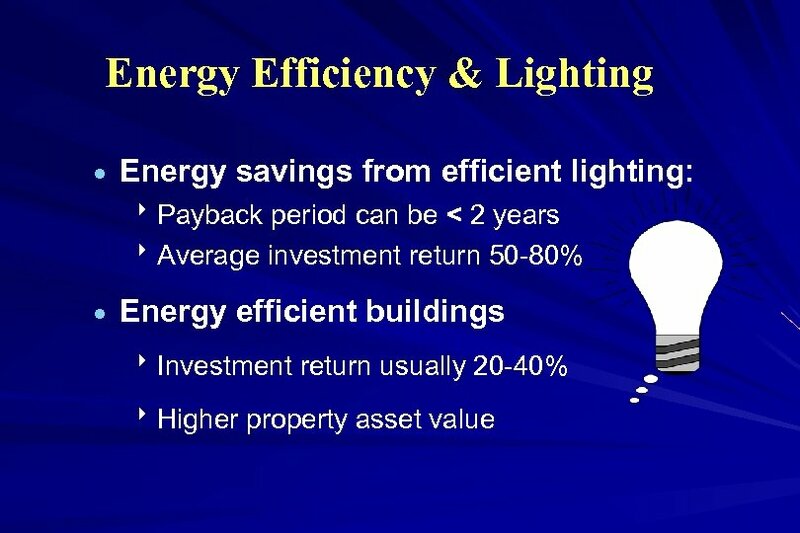 Energy Efficiency • Minimize the electric loads from lighting, equipment, and appliances. • Consider alternative energy sources such as photovoltaics and fuel cells that are now available in new products and applications. Renewable energy sources provide a great symbol of emerging technologies for the future. 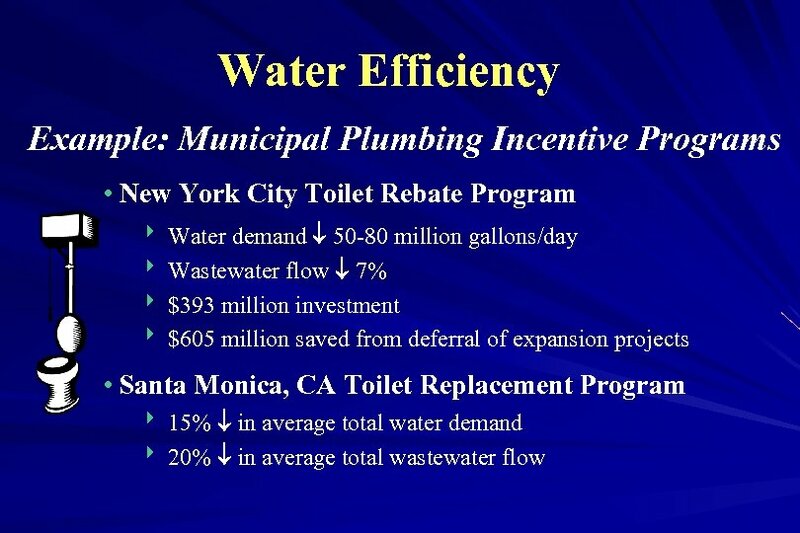 • Install water-conserving toilets, showerheads, and faucet aerators not only reduce water use, they also reduce demand on septic systems or sewage treatment plants. 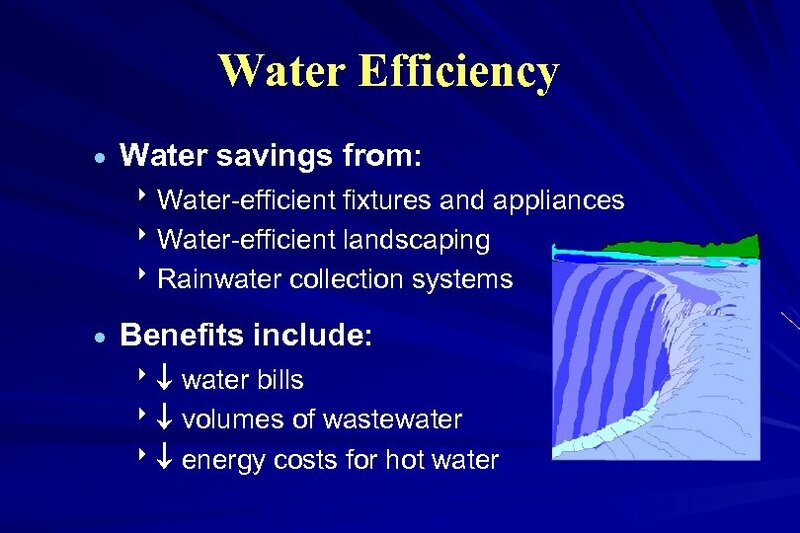 Reducing hot water use also saves energy. 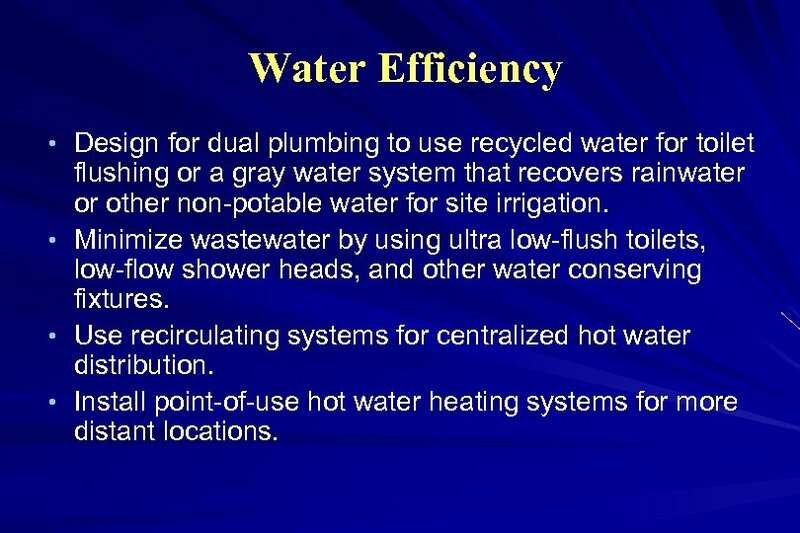 Water Efficiency • Design for dual plumbing to use recycled water for toilet • • • flushing or a gray water system that recovers rainwater or other non-potable water for site irrigation. Minimize wastewater by using ultra low-flush toilets, low-flow shower heads, and other water conserving fixtures. 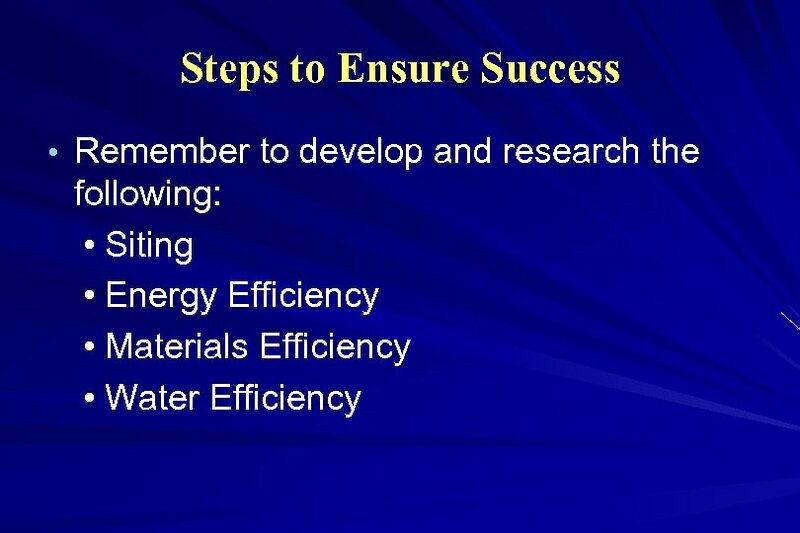 Use recirculating systems for centralized hot water distribution. Install point-of-use hot water heating systems for more distant locations. 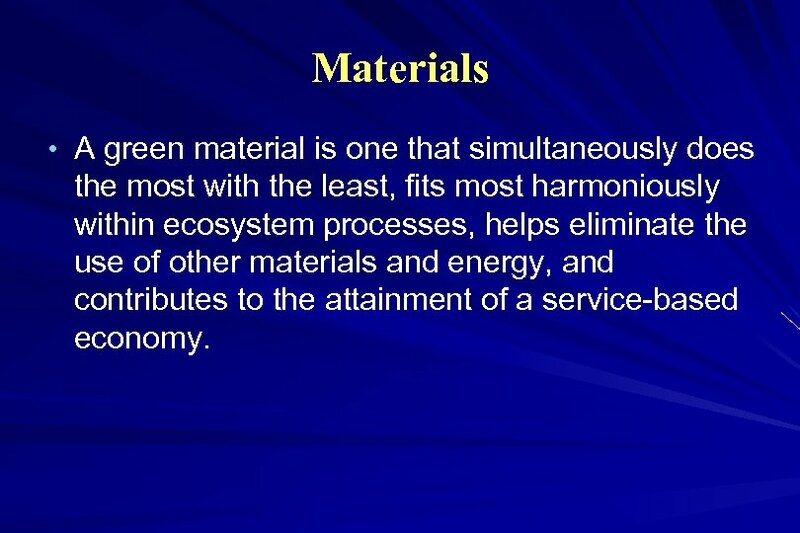 Materials • A green material is one that simultaneously does the most with the least, fits most harmoniously within ecosystem processes, helps eliminate the use of other materials and energy, and contributes to the attainment of a service-based economy. 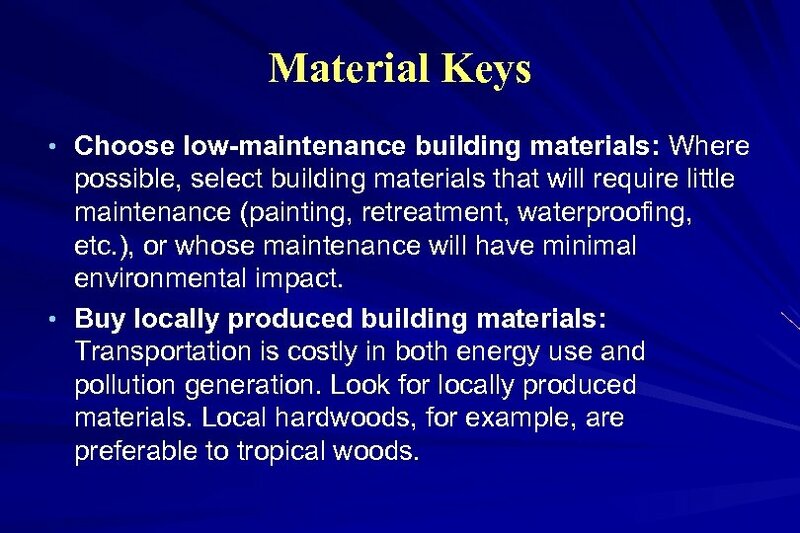 Material Keys • Choose low-maintenance building materials: Where possible, select building materials that will require little maintenance (painting, retreatment, waterproofing, etc. 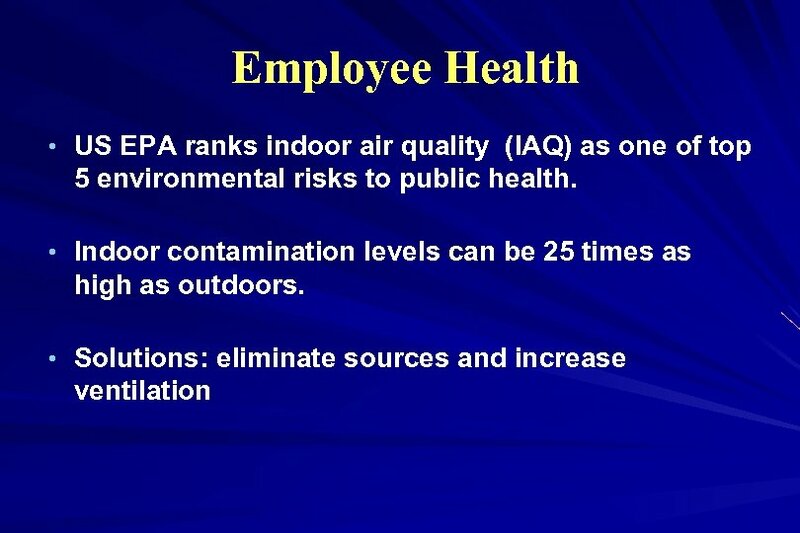 ), or whose maintenance will have minimal environmental impact. 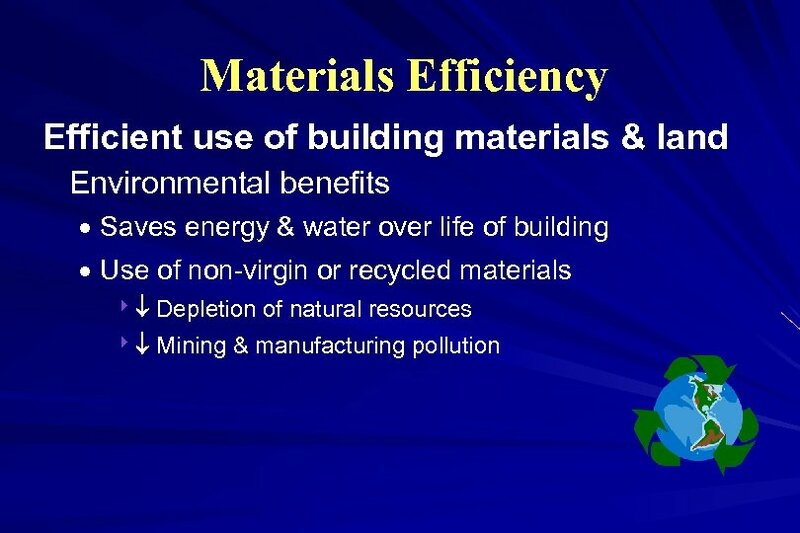 • Buy locally produced building materials: Transportation is costly in both energy use and pollution generation. Look for locally produced materials. Local hardwoods, for example, are preferable to tropical woods. 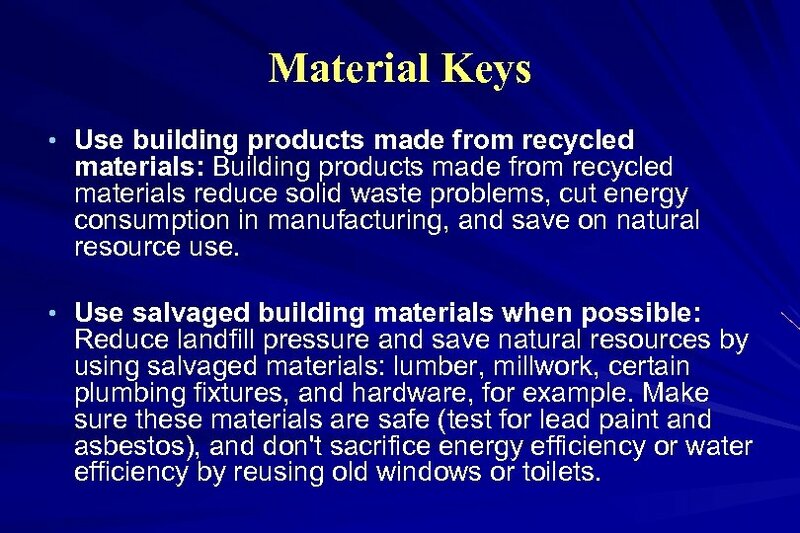 Material Keys • Use building products made from recycled materials: Building products made from recycled materials reduce solid waste problems, cut energy consumption in manufacturing, and save on natural resource use. 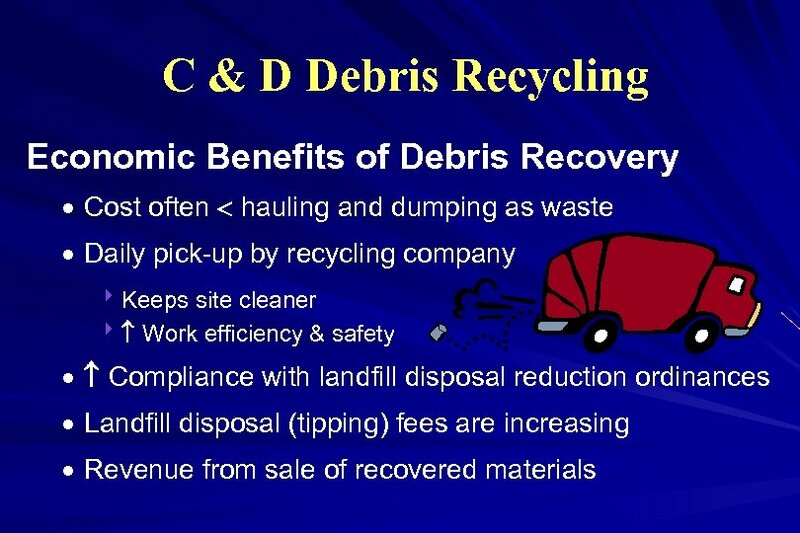 • Use salvaged building materials when possible: Reduce landfill pressure and save natural resources by using salvaged materials: lumber, millwork, certain plumbing fixtures, and hardware, for example. 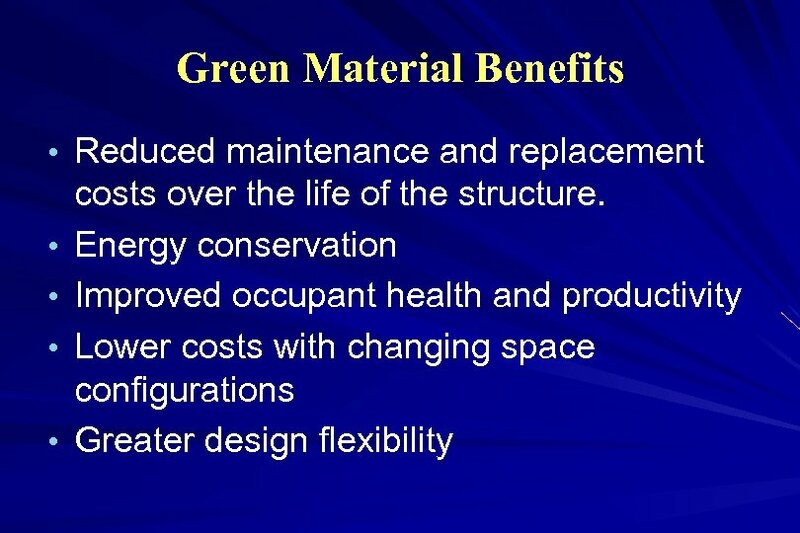 Make sure these materials are safe (test for lead paint and asbestos), and don't sacrifice energy efficiency or water efficiency by reusing old windows or toilets. 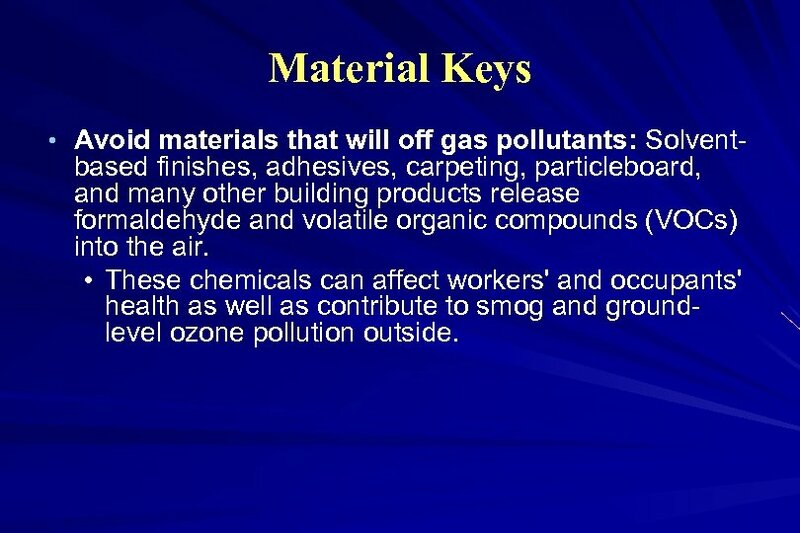 Material Keys • Avoid materials that will off gas pollutants: Solvent- based finishes, adhesives, carpeting, particleboard, and many other building products release formaldehyde and volatile organic compounds (VOCs) into the air. 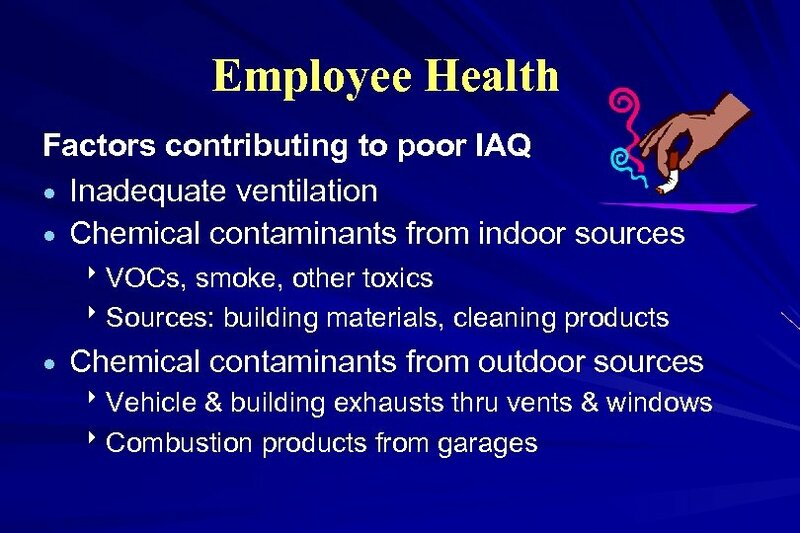 • These chemicals can affect workers' and occupants' health as well as contribute to smog and groundlevel ozone pollution outside. 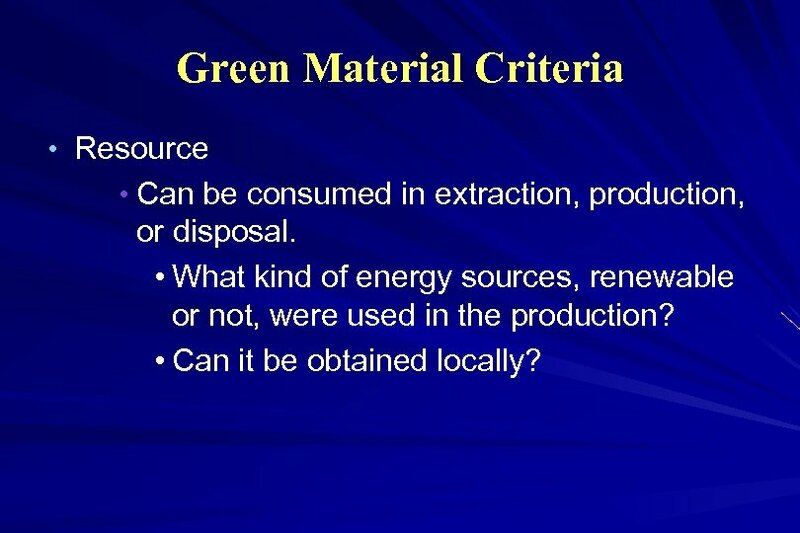 Green Material Criteria • Resource • Can be consumed in extraction, production, or disposal. • What kind of energy sources, renewable or not, were used in the production? • Can it be obtained locally? 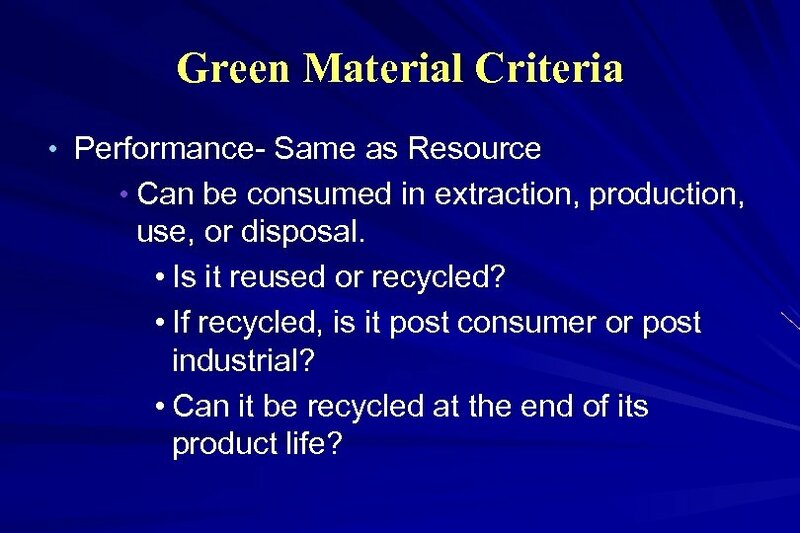 Green Material Criteria • Performance- Same as Resource • Can be consumed in extraction, production, use, or disposal. 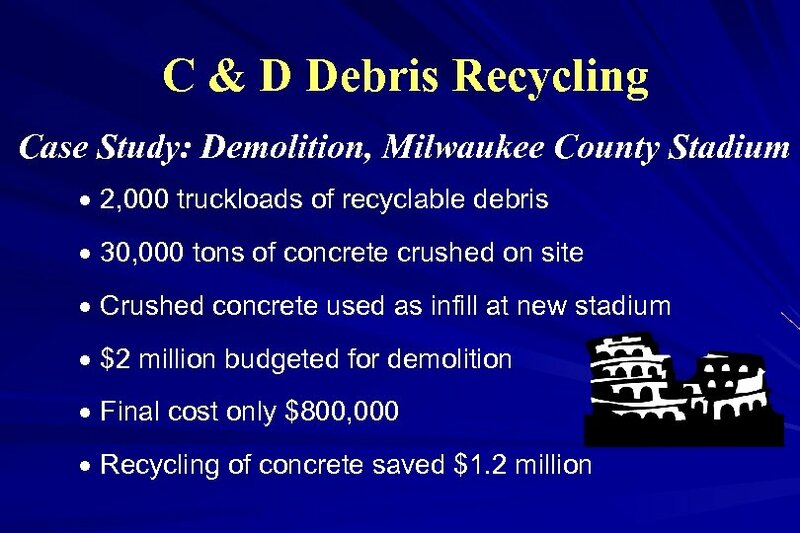 • Is it reused or recycled? 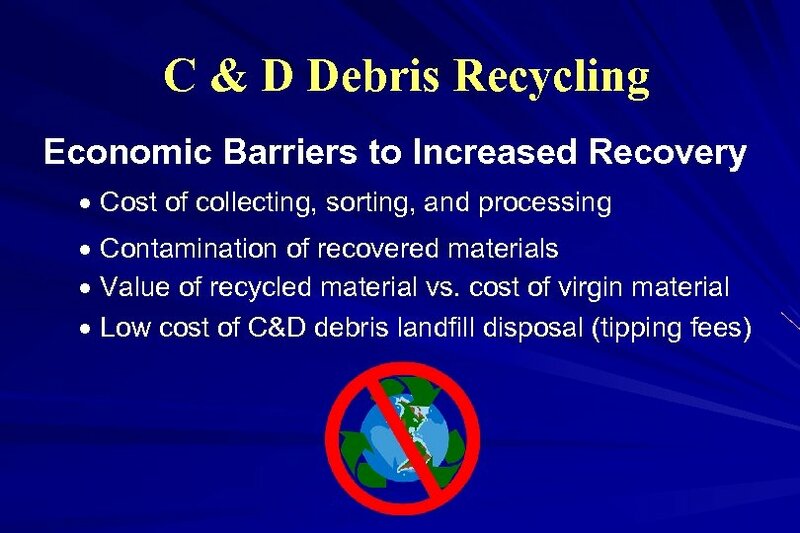 • If recycled, is it post consumer or post industrial? 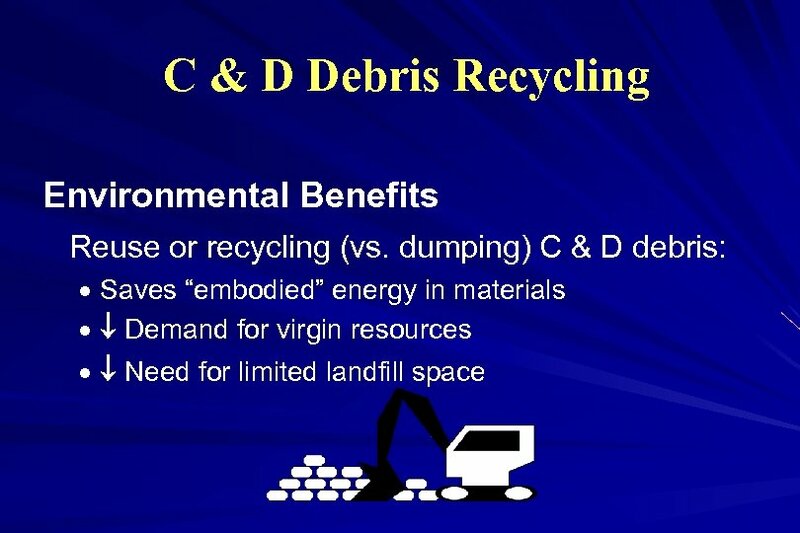 • Can it be recycled at the end of its product life? 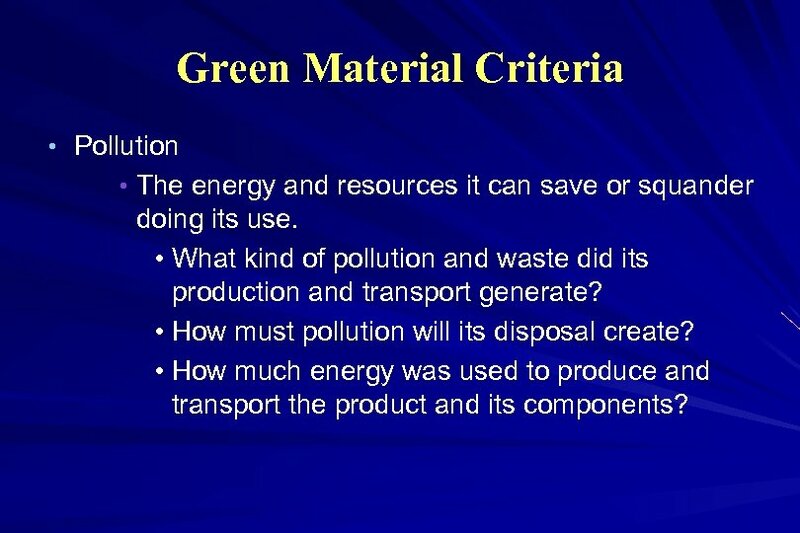 Green Material Criteria • Pollution • The energy and resources it can save or squander doing its use. 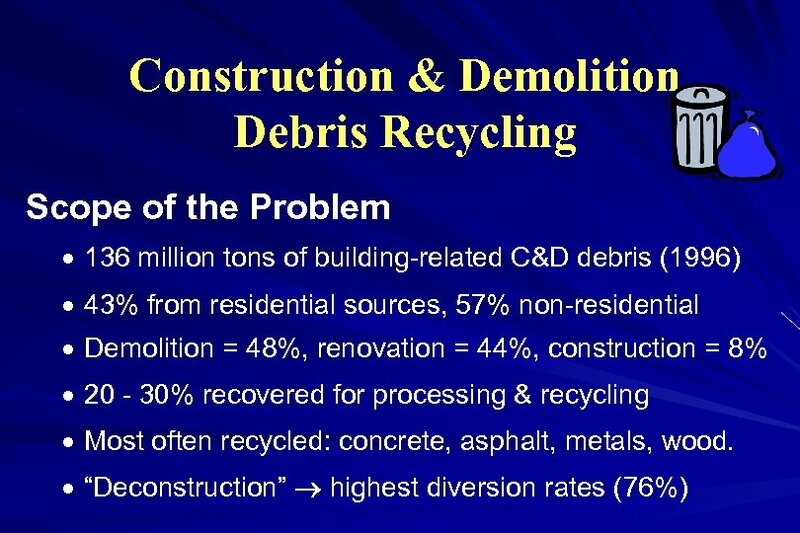 • What kind of pollution and waste did its production and transport generate? 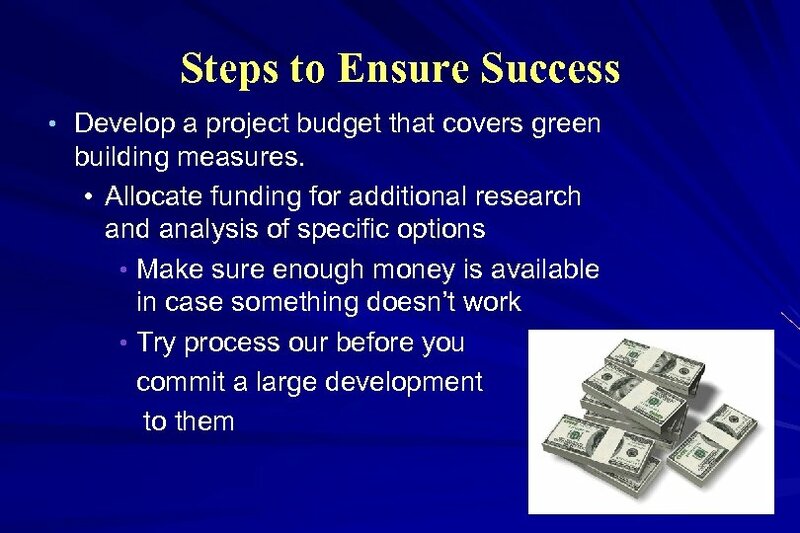 • How must pollution will its disposal create? • How much energy was used to produce and transport the product and its components? 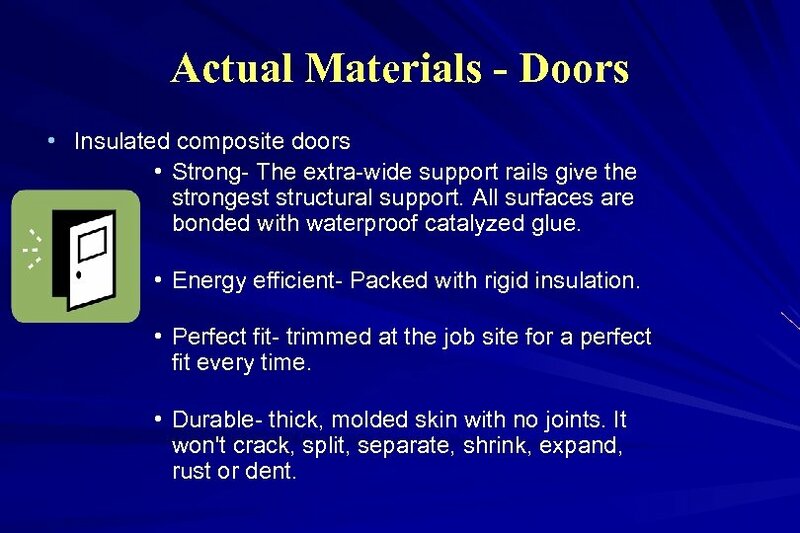 Actual Materials - Doors • Insulated composite doors • Strong- The extra-wide support rails give the strongest structural support. 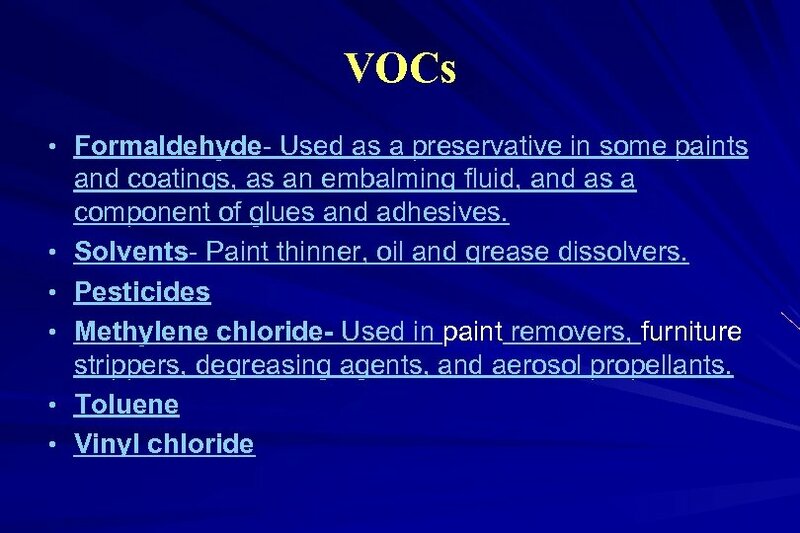 All surfaces are bonded with waterproof catalyzed glue. • Energy efficient- Packed with rigid insulation. • Perfect fit- trimmed at the job site for a perfect fit every time. • Durable- thick, molded skin with no joints. It won't crack, split, separate, shrink, expand, rust or dent. 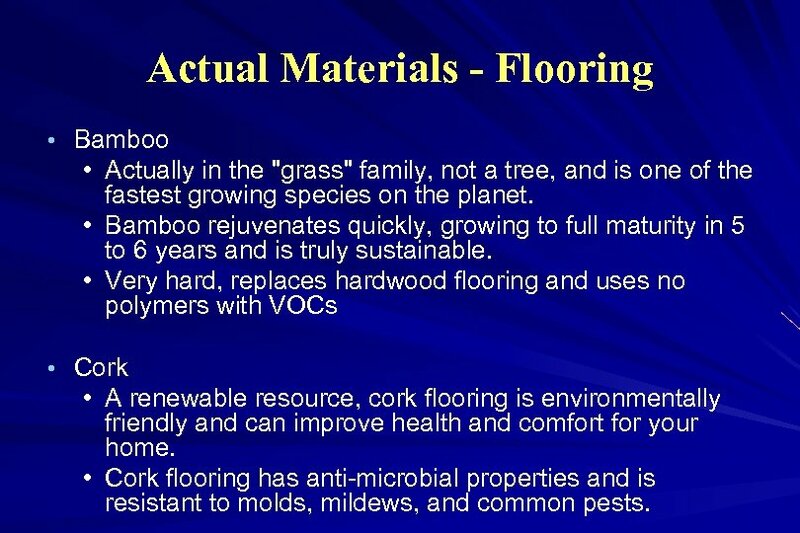 Actual Materials - Flooring • Bamboo • Actually in the "grass" family, not a tree, and is one of the fastest growing species on the planet. • Bamboo rejuvenates quickly, growing to full maturity in 5 to 6 years and is truly sustainable. • Very hard, replaces hardwood flooring and uses no polymers with VOCs • Cork • A renewable resource, cork flooring is environmentally friendly and can improve health and comfort for your home. • Cork flooring has anti-microbial properties and is resistant to molds, mildews, and common pests. 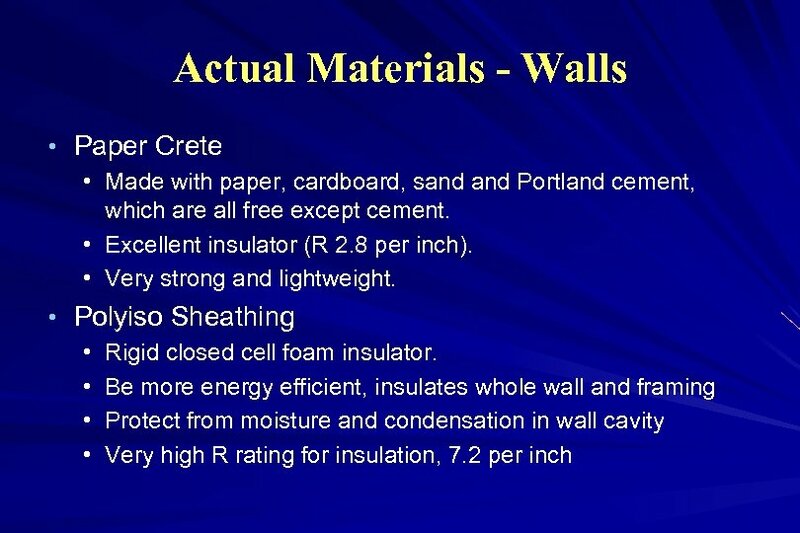 Actual Materials - Foundation • Insulated Concrete Forms • foam block walls are so well insulated that manufacturers predict a home's monthly heating and cooling costs can be reduced up to 75 percent. 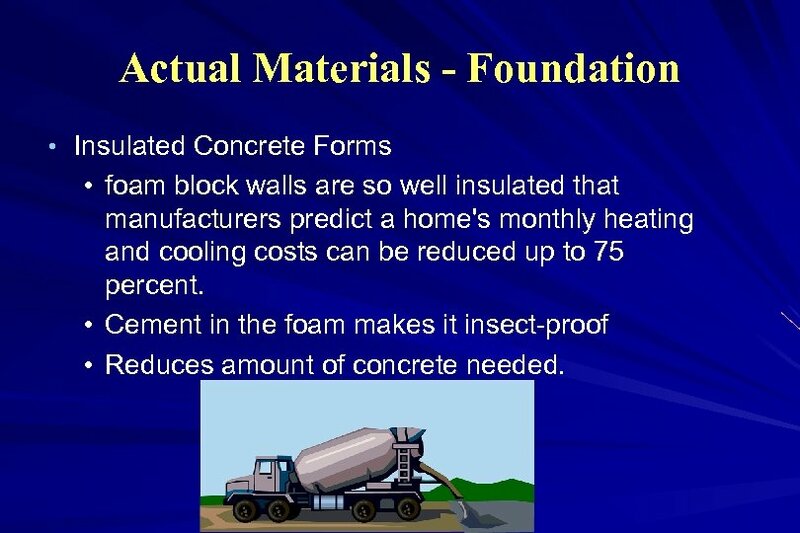 • Cement in the foam makes it insect-proof • Reduces amount of concrete needed. 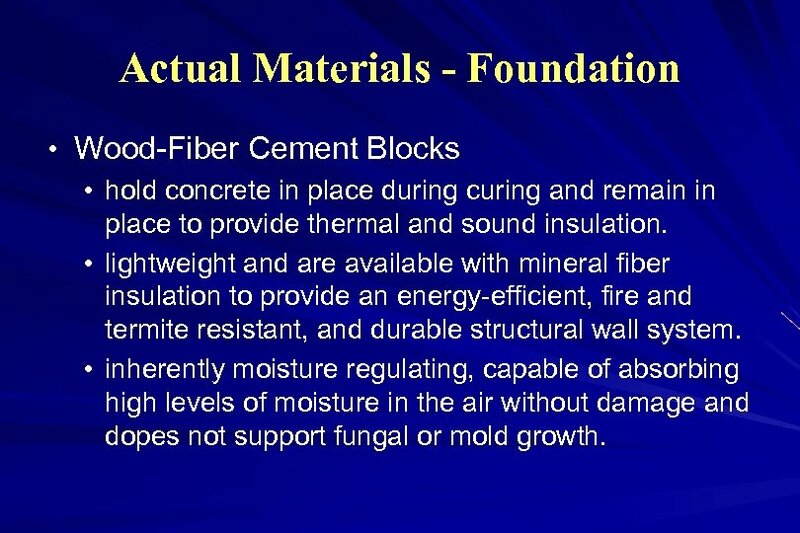 Actual Materials - Foundation • Wood-Fiber Cement Blocks • hold concrete in place during curing and remain in place to provide thermal and sound insulation. • lightweight and are available with mineral fiber insulation to provide an energy-efficient, fire and termite resistant, and durable structural wall system. • inherently moisture regulating, capable of absorbing high levels of moisture in the air without damage and dopes not support fungal or mold growth. 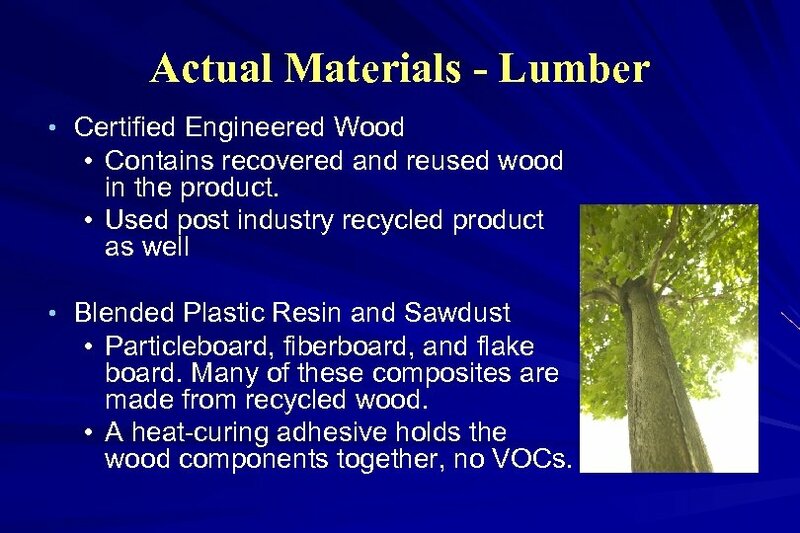 Actual Materials - Lumber • Certified Engineered Wood • Contains recovered and reused wood in the product. • Used post industry recycled product as well • Blended Plastic Resin and Sawdust • Particleboard, fiberboard, and flake board. Many of these composites are made from recycled wood. 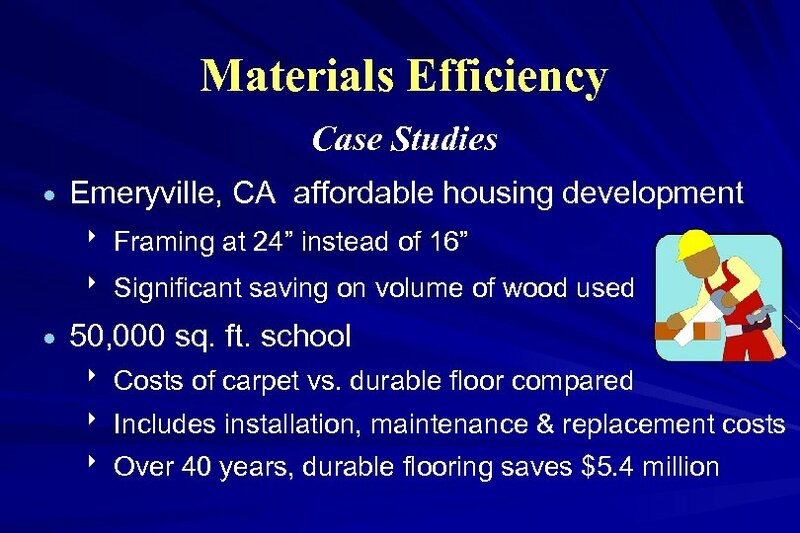 • A heat-curing adhesive holds the wood components together, no VOCs. 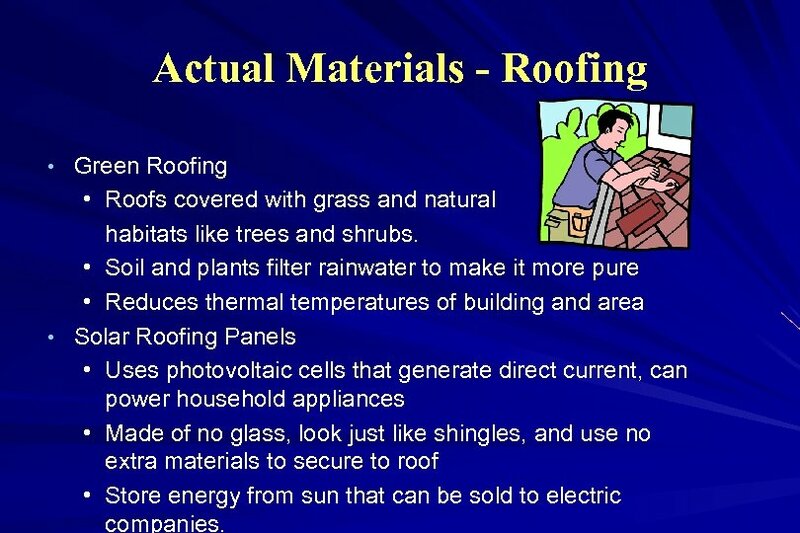 Actual Materials - Roofing • Green Roofing • Roofs covered with grass and natural habitats like trees and shrubs. • Soil and plants filter rainwater to make it more pure • Reduces thermal temperatures of building and area • Solar Roofing Panels • Uses photovoltaic cells that generate direct current, can power household appliances • Made of no glass, look just like shingles, and use no extra materials to secure to roof • Store energy from sun that can be sold to electric companies. 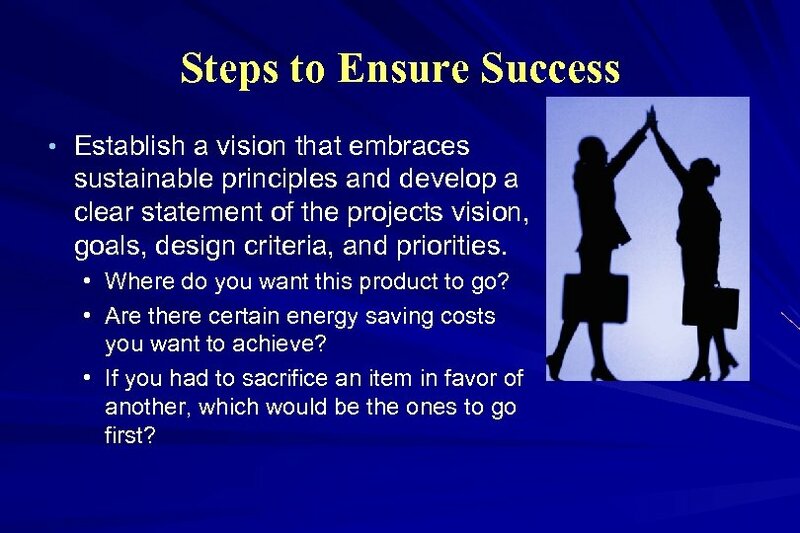 Steps to Ensure Success • Establish a vision that embraces sustainable principles and develop a clear statement of the projects vision, goals, design criteria, and priorities. • Where do you want this product to go? 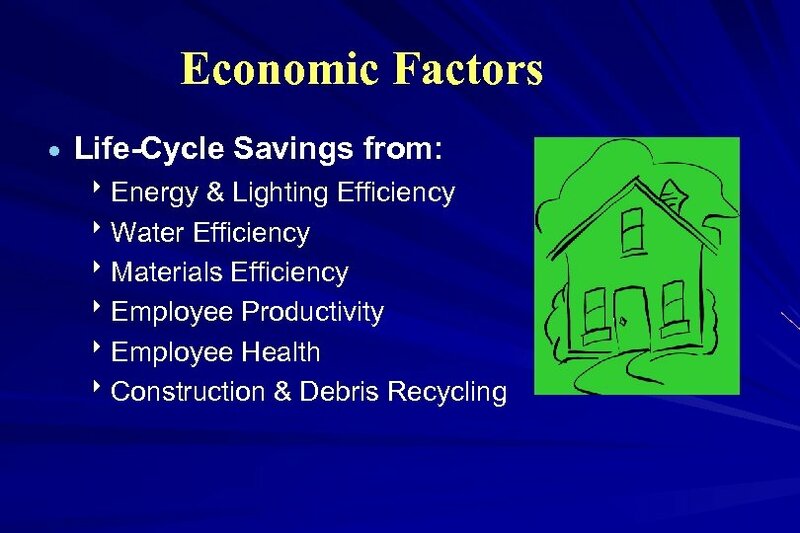 • Are there certain energy saving costs you want to achieve? • If you had to sacrifice an item in favor of another, which would be the ones to go first?